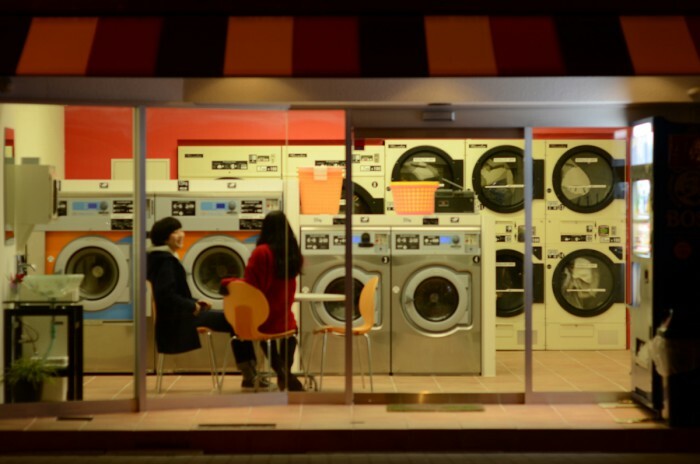 Natsuka Kusano’s 2014 debut, “Antonym,” is in many ways a first-time film aesthetically, narratively and thematically. It does not break any new ground – not that this is a prerequisite for first-time filmmakers and films – but Kusano’s work doesn’t even try to tread the familiar paths of similar works that feature the creative process as being integral to the plot. Koki Mitani’s “Welcome Back, Mr. McDonald” (1997), Ed Harris’s “Pollock” (2000), the Coen Brothers’ “Barton Fink” (1997), and Woody Allen’s “Bullets over Broadway” (1994) have either satirized the notion of the artist, reveled in the chaotic beauty of creation, or eulogized the destruction of the artist. Instead, “Antonym” is dragged down by narrative and thematic inertia as Kusano devotes too much time building a sense of false ennui and quirkiness. The main “heart” of Kusano’s film is the development of a relationship between two women: Aya (Yuri Ishizaka), the pretty one that you think has nothing to worry about but is in fact a bundle of neuroses, and Sachiko (Asami Shibaya), the quiet dowdy type who you pity at first but then realize as the story progresses has a good head on her shoulders. To create something resembling conflict, Kusano and her screenwriter Tomoyuki Takahashi utilize the artificial structure of a deadline, specifically a radio drama competition, as Sachiko tries to help Aya with her radio script and Aya fights her every suggestion. However, the only reason why they are connected to one another is that Aya needs a pretend friend/writing partner so that her script won’t be taken away from her. Nothing in the story or in Aya’s psychology makes it believable that these two women would end up as friends. In fact, the entire premise that these women are linked, somewhat cleverly illustrated by having the two leads dress in similar wardrobe, is so contrived and pointless. No one, outside of narcissists and maybe psychotics, believes that a major requirement to be one’s friend is that they somehow dress and act like us. What I take great umbrage with in “Antonym” is not that the film is slow and boring, though it does suffer from these qualities (at a scant 73 minutes in length, it drags its feet telling a story that could have been pared down to a solid 30- to 45-minute runtime). It is the fact that the film is a retread of a lot of well-worn indie/art film/contemplative cinema tropes to make those genres seem downright cliché. Meanwhile, many new and veteran filmmakers are releasing far more fascinating and daring fare that utilize the same tropes that Kusano’s film copies but in a more inventive manner. The film also peddles a painfully embarrassing brand of faux-existentialist philosophy. Lines like, “Even though we eat the same, see the same, why are we so different?” sounds like dialogue straight out of the mouth of hippy-dippy high school teenagers rather than two dour 20-somethings. I could continue airing my laundry list of grievances with “Antonym,” but unlike Natsuka Kusano’s film I don’t wish to overstay my welcome. It suffers from many first feature issues that could have been corrected either during the scripting or editing phase of production. Yet, with all this said, I do hope Kusano does get a chance to make a sophomore effort. Artists should not be judged merely on the merits of their first work, and there have been plenty of established auteurs with sub-par debut films. Here’s hoping that Kusano’s next feature will erase the memory of her first.